Who is involved: Chinese Wellbeing organisation. Nature of activity: A pilot Black, Asian and minority ethnic (BAME) and Faith Communities Dementia Champions project funded by Merseycare National Health Service Trust aimed to raise awareness of dementia within five communities, improve knowledge and understanding of dementia, and reduce social stigma. The initial pilot was successful in achieving its aims and the project was continued. Chinese Wellbeing, a registered charity which delivers culture and language-specific health and social care services within the Chinese community, was one of the beneficiary organisations. Chinese Wellbeing had already begun to explore ways to respond to the needs of their service users through a Winter Survival Project called ‘Soup and a Movie’ which was delivered across a number of sheltered housing schemes. This work highlighted the need for more language and culturally aligned reminiscence activities to cater for the specific needs of the Chinese community, which could not be met by mainstream Memory Cafes. Memory box and reminiscence activities were developed and became the pilot for ‘Tea House Reminiscence’, something that is meaningful and has cultural resonance for Chinese people. The sessions are not currently exclusively for people living with dementia, and are open for those who are at risk of developing dementia and their carers. 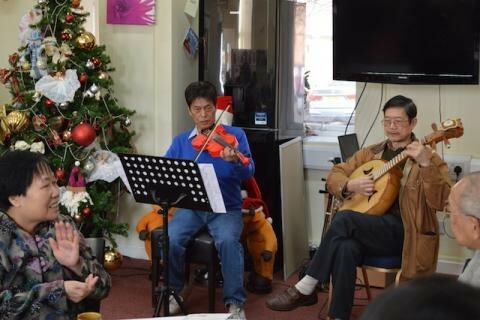 Tea House Reminiscence is unique in Liverpool and provides a safe haven for the Chinese older people to socialise. Chinese Wellbeing’s very own chef prepares a traditionally cooked lunch including a tasty and nutritious soup which often evokes memories from the past. Chinese Wellbeing’s success in reducing social stigma is perhaps evidenced by the fact that people living with dementia are now joining the sessions; they are able to be more open about their dementia as it is less stigmatising in this environment. Tea House Reminiscence® is run by Chinese Wellbeing’s Mental Health Lead Rita Lee with assistance from the Dementia Champion and support workers who are all bilingual and can speak a number of local dialects. Service users from all walks of life certainly enjoy Tea House which has generated a very positive response from the community as a whole. Chinese Wellbeing was encouraged by the Dementia Engagement and Empowerment Project (DEEP) to develop a service user-led network which began with the creation of the Liverpool Chinese Dementia Support Network. With the aim of creating a sustainable user led network the group set out to establish the priorities for those members living with dementia. A dementia-specific Tea House was top of the list. Chinese Wellbeing is now in discussions with the Liverpool Clinical Commissioning Group which has recently agreed to the development of this much needed service.